This tour includes the interiors and outdoor spaces of the parkan fortification wall with commentary on the development of the castle construction. 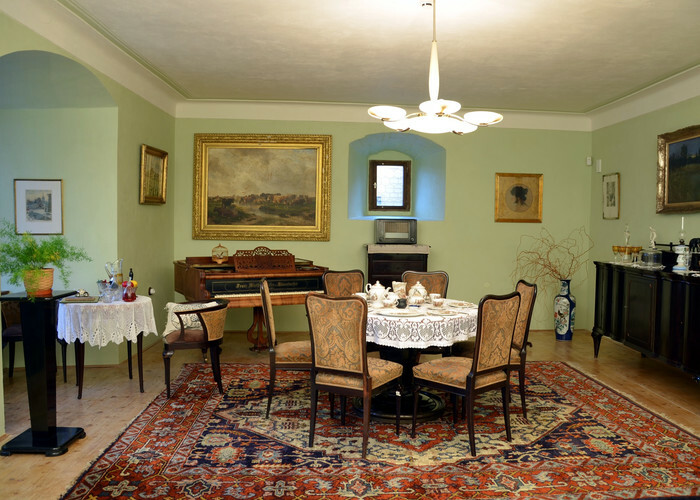 The exhibit recalls the history of the Buquoy family from the arrival of the founder of the family branch in Bohemia, Karel Bonaventura Buquoy, to after the construction of the new castle on the outskirts of Nový Hrady and the establishment of the landscape park in the Terezin Valley. The installation of the rooms is inspired by gouaches by B. Str?bela showing the interiors in the mid-19th century and includes the largest portrait gallery of the Buquoy family in Bohemia, with a portrait of Sophia Theresa Buquo, by the important 19th century Viennese portraitist Franz Schrotzberger,the extensive collection of gouaches by A.G. Schulze from the mid-19th century of Nové Hrady and the surroundings, including views of the castle, and the Terezin valley, a hunting still life by Philipp Ferdinand de Hamilton and portraits of horses from his brother Johann Georg de Hamilton, the Ancestral Hall of Fame, the Buquoy archive, the first floor of the tower above the entrance gate. On the second floor of the tower there is an exhibition of glassmaking from Nové Hrady, built in collaboration with the Museum of South Bohemia in České Budějovice, with exhibits of clear engraved and cut glass and with examples of the unique black and red opaque hyalit glasse and agatino and lithyalin glass. There is also the original library with over 17,000 volumes. A view into the six-room apartment of the estate steward of the early 20th century. At the end of the tour there is a unique opportunity to view the courtyard of the castle and the town from a wooden courtyard balcony. Exhibits from the 19th and early 20th centuries include a comprehensive set of furniture from the estate of a Nové Hrady pharmacist from the early 20th century and a collection of mostly Impressionist landscapes from the 19th and 20th centuries. Discount when combined with Tour Route I.